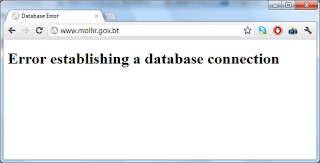 This morning I discovered that www.molhr.gov.bt is down. Although frustrating for users of eGov services, these things happen, and a quick fix would be expected. The catch is that a fix won't happen unless the website admin is aware that there is a problem. There are various services that provide alerts and notifications when your website is down. Some will even notify you by a tweet or SMS (for example, the free DingItsUp service, although SMS is unavailable in Bhutan). 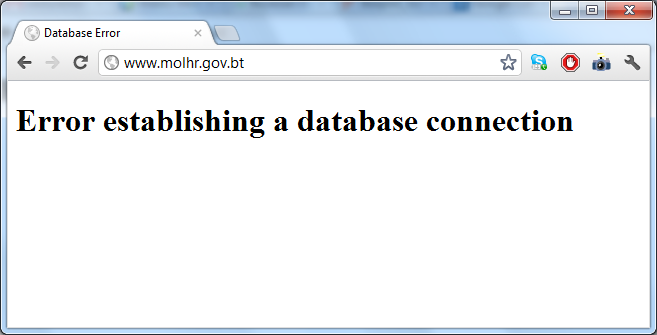 We alerted the IT dept at MOLHR, so hopefully the website will be up and running soon.